Last weekend, quite literally half a world away, my grandmother died. She had survived a long illness many years ago—had come back stronger. But this was not that. This was her heart. And it happened very quickly. Hours after I hear the news, I walk alone to campus to pack up my office. I'm changing jobs and moving states at the end of the month, more specifically, on the day I'm now scheduled to return from her memorial service. Everything has to be ready to go, so I switch into organizational overdrive, which is good because it's distracting. I want to be distracted because I'm too far from the rest of my family who are processing their grief together. 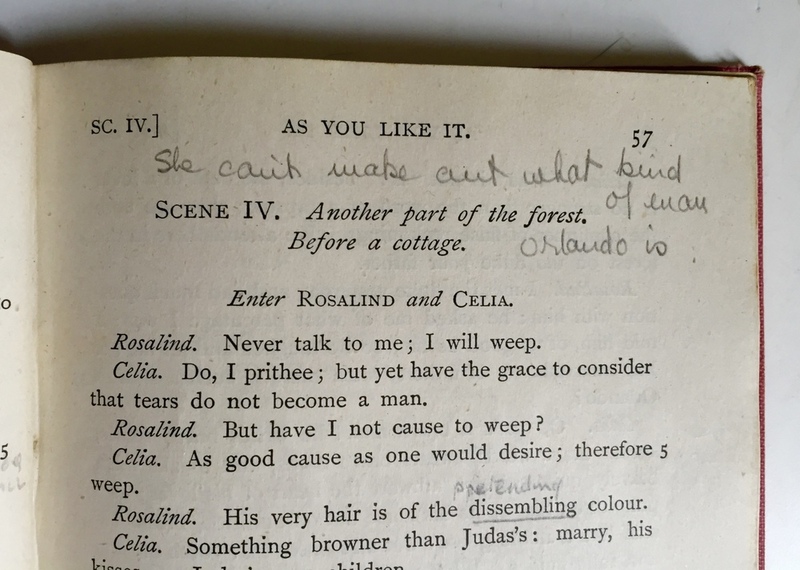 Then, among the books in my teaching collection, I find her high school copy of As You Like It. I can't remember when she gave it to me. I can't remember examining it too closely before now. So I open it there, under the florescent lights of the windowless office I'm about to vacate. It's an odd sensation to open a book and discover annotations, marginalia, marks, and inscriptions made—before you were you—by someone whose life has been so intrinsic to your own. Most of the time, we (as scholars) crave a fraction of this intimacy with the people (often unknowable) who have left behind idiosyncratic traces of their reading in the books we study. Happening across this book on this day is a happy coincidence. My grandmother introduced me to Shakespeare. She took me to outdoor performances in Cape Town when I was younger. She encouraged me to embrace the challenges of language and circumstance and, it seems to me now, the materiality of textual transmission. She bequeathed to me my grandfather's set of the complete works when she heard I was pursuing a PhD in early modern literature. She gave me this book, not particularly valuable in and of itself but rather (I now realize) for how it captures her reading practices and makes me feel less far away. Perhaps she knew it would give me comfort and a way of being close to her after she was gone. She was pragmatic and organized about such things. She inscribed the book not once but twice—on the pastedown (which shows a sense of humor, I think) and one on the fly leaf (which dates her use of the book to ca January 1946). She has provided a bit of commentary about genre on the first page of the playtext: "It is a comedy. (It ends happily)." Throughout the book she offers short synthetic descriptions of the action, including the remark that Rosalind "can't make out what kind of man Orlando is." Sometimes, too, she records an opinion. She apparently didn't like Oliver very much! She paraphrases, parses words, notes alliteration, underlines "famous" passages, attends to what she was taught were the formal qualities of the play's five-act structure. On this page, I am particularly struck by the note at the bottom: "THE MUSKROSE = smells lovely." There's no reference to roses in 2.1, but earlier in the play, Celia refers to Rosalind as "my sweet Rose." What I love about this note, though, has nothing to do with the play and everything to do with my grandmother's deep knowledge of flowers. (She married a botanist, after all.) Here, then, she notes the fragrance of a flower (not totally irrelevant to the play, mind you) in the margins of her Shakespeare. There are a number of loose leaves folded and tucked into the book. Among these is her own "scenario" of the play—a scene-by-scene description. The other is a paraphrase of John Milton's sonnet "On Blindness." Then there is, of course, the matter of that speech, the one about the cycle of life and death, entrances and exits. She has not annotated it. In fact, there's a conspicuous lack of commentary here. Instead, she has underlined it neatly (she was always neat), using a ruler. This order and care—this is what she was like. Never wanting to take up too much space but always the scaffolding for her family, her friends, and all who knew her.